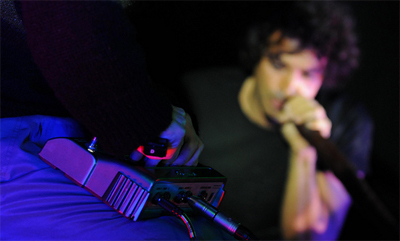 Italian duo LegoLoop cut electro, jazz and house with edgy tribal grooves, quirky toon-town blips and looping beats. Add sensual, syrupy-soaked vocals and dark poetic yearning for the ultimate in trans-continental indie pleasure. Ambient stuff for you while we wait for a football (soccer) game to end and the Talent to begin. Yeah…we love the modern world. great duo! thank you PASS! Greetings from Colombia!